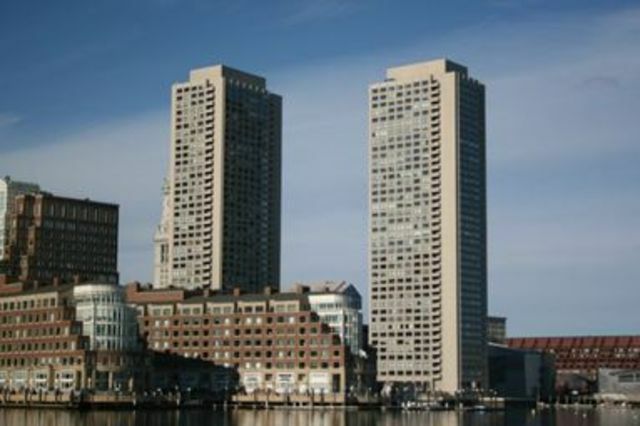 The Harbor Towers, located directly on the waterfront and near the Rose Kennedy Greenway on India Wharf, are 2 identical full service, condominium residences. At 40 floors each, they are the tallest residential towers in Boston, offering great views of the waterfront and Financial District. The location of the Harbor Towers is full of history, as Charles Bullfinch, one of Boston’s most famous architects, designed India Wharf. The building itself was built in 1971 as apartments and designed by I.M. Pei, considered one of the masters of modern architecture. In 1981, apartments were renovated and fully converted into condos. Since then, condos have been renovated and updated individually by unit owners, so no two condos are the same. Many condos have a spacious balcony where you can enjoy the outdoors and enjoy the waterfront view. You also have access to a heated seasonal Oceanside pool. For more spacious outdoor areas to explore, you can choose to either visit the landscaped grounds or the Boston Harbor Walk that is adjacent to the property. Right near the Harbor Towers are historical landmarks, such as Faneuil Hall and the Freedom Trail. Within walking distance, you can attend to business in the Financial District and then explore and enjoy a meal in the North End, Boston’s Italian-American neighborhood. With the Government Center T and bus stop nearby, you can easily transport to other neighborhoods in Boston. Garage parking also gives you convenient access to your car.